In the realm of orchard care, there are few things as satisfying as harvesting fruit at perfect ripeness, or the excitement of growing a new varietal, and that is using and maintaining the right tools for the job. Ah, we orchardists are a practical and hardworking lot! The tasks are many in an orchard — from digging holes for trees and shrubs, turning over compost and layering wood chips, to pruning and harvesting fruit from out-of-reach branches. In service to all those who tend orchards with dedication, we offer you this quick breakdown of some of our trusty tools of the trade for home and community orchards and suggestions for keeping them in tip-top, sharp shape. If you’re care-taking your garden or orchard for the long haul, it’s worth the investment to choose high quality tools that feature thick, wooden handles and heavy-gauge tempered metals that will be more durable through the years. 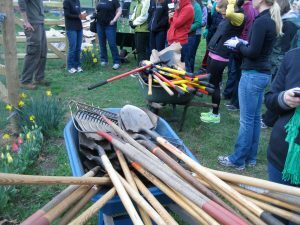 If you choose to share tools, rather than purchase, check out your local tool library such as The West Philly Tool Library, who in partnership with POP in making orchard tools available, offers tool rentals for a membership fee between $20-50 annually. There is also a Kensington Tool Library in North Philly in the works. Shovels, forks, and rakes perform most of the essential functions for groundwork – but which ones to use? Select pointed shovels for digging holes, as when you’re preparing the ground to plant a bare root tree, and square-blade shovels for moving materials, like the excess soil you’ve dug out. Garden spades have a defined U-shape edge that allow you to work with greater precision and in tighter areas. Long-handled shovels will give you more leverage from an upright position to loosen ground soil when you’re preparing a hole for planting. Good shovels range in price between $30-40. When you’re working on a smaller scale and a shovel is too unwieldy, trowels and digging knives come in handy. Both will allow you to dig the appropriate sized holes for herbs and groundcovers. 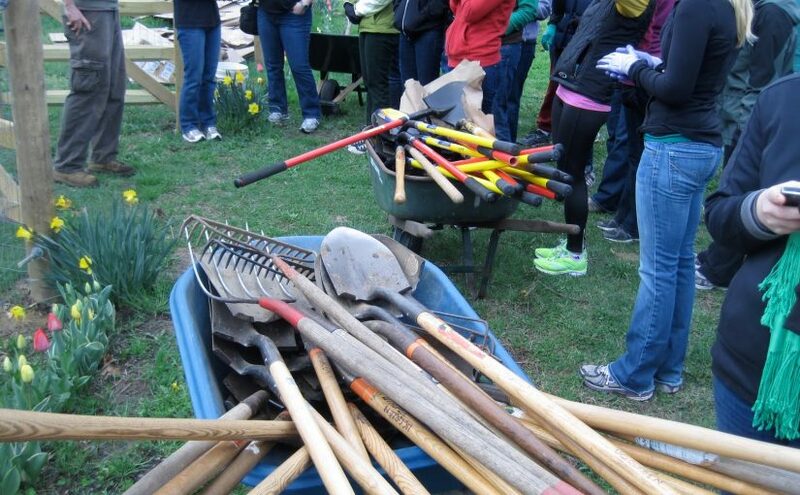 Traditional, digging, or potting trowels of metal will be much sturdier than plastic ones, obviously, but the plastic may be well-suited for planting with children in a well-prepared bed. Where digging knives or the Japanese hori hori ($13-60) can have the edge-up on trowels is that they have one serrated edge that can assist with breaking up compacted soil, or cutting through tough roots. A word of advice: if you choose a model with a wooden handle, you might consider wrapping the handle in a fluorescent or patterned tape, as they easily get camouflaged against the brush. Don’t let it happen to you! Like shovels, forks come in a number of forms, so it’s important to understand what function do you need from your fork. Most often, we use garden forks that have four, long and super-strong tines that are helpful for digging compacted soil and tough root systems and a compost fork or pitchfork which is a great choice for scooping materials from a pile like woodchips or compost with its slender tines that curve-up at the end. When shovels or garden forks may not be strong enough to deal with rocky or clayey soil, pickaxes with their sturdy spike and chiseled ends can be a great asset for breaking up ground and uprooting heavy root systems. A pickaxe will be your best friend when you’re trying to tear out tenacious, invasive tree trunks to make way for new plantings. Choose a bow rake for its short, metal tines arranged along a parallel plane for spreading heavy materials like compost or mulch after you’ve dumped them out of your wheelbarrow. Leaf rakes are of course made for leaves! A look at POP’s tool chest for pruning: bow saw, handsaw, isopropyl spray, hand pruners, sharpener, loppers, pole saw, pole pruners, and pole pruner/saw combo. When selecting hand pruners, select bypass motion pruners, which are best for close, clean cuts on live branches. The scissor-like motion is ideal for cutting 1.5-2” diameter branches between both sharpened blades, whereas anvil motion pruners can sometimes mash live branches between their sharpened blade and fixed anvil. Keep in mind with most tools, that those that are regularly sharpened with a file will maintain the health and integrity of your plants through sharp, clean cuts. Ideally, sharpen your tools after each pruning session, or at the very least, every season. When you’re selecting pruners, choose a tool that fits your hand size to avoid unnecessary hand strain and pick ones with durable hand coverings, sturdy springs, shock-absorbing bumpers and high-carbon steel blades. Pruners you can loosen and tighten will give you added flexibility for making more precise cuts. As with most tools, it is worth investing in quality tools that will perform better and last longer. We prefer Felco or ARS brand hand pruners for this reason. For pruning dead wood and larger 3” diameter branches, a folding hand-saw and anvil-style loppers ($25-50) will come in handy! Refer to POP’s Pruning Guide for more specificity on how to make various types of pruning cuts with these tools. If the trees’ branches are beyond your reach for pruning, you will need a pole saw, pruner, or combo tool, which can be extended up into the canopy at heights of 10-30 ft, which are ideal for heading cuts and removing high-up branches. Combo tools feature a rope-pull system that cuts branches and a high-carbon razor-tooth steel blade, as in this model from Corona (under $100). We also love our long reach pruners from ARS. When fruit is beyond reach for picking, a fruit pole picker can help! 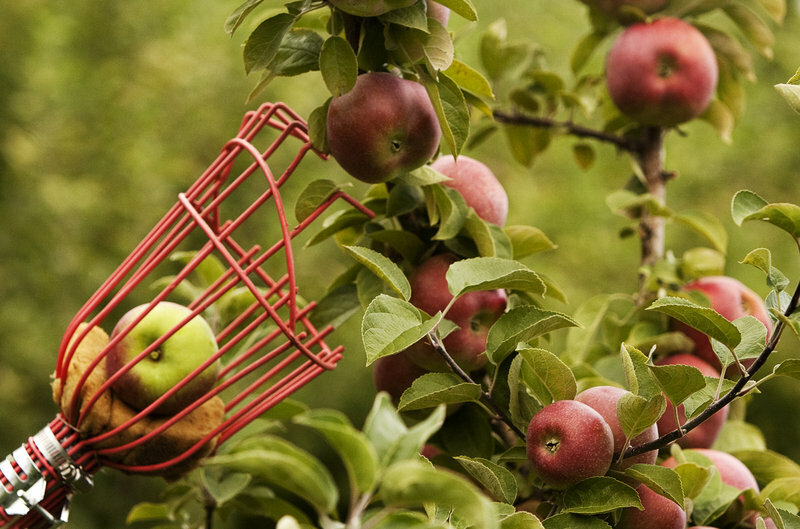 The basket at one end allows you to reach high into tree to pluck and capture fruit in the basket. Still out of reach? Establish your perch on a tripod orchard ladder, with a wide-flared base and extendable leg to support the climbing harvester (also great for pruning!). Wearable fruit picking bags or buckets allow you to quickly and efficiently store your fruit as it’s being picked. If you’re trying to grow the more common fruits (apples, peaches, plums, cherries, apricots, and pears), most likely you will encounter pest or disease challenges at some point that make spraying equipment necessary to ensure good production and tree health. For the most part, organic fruit growing doesn’t mean not spraying, it just means spraying different things! If you have just a few trees, you might get away with a 1 or 2 gallon hand sprayer. A 3 or 4 gallon backpack sprayer is much more efficient for larger orchard plantings. If you are spraying harsher organic sprays like sulfur or copper fungicides, it is advisable to have a separate sprayer used only for those applications. NOTE: Many of the more unusual fruit options (figs, persimmons, paw paws, etc) have few if any pest or disease problems and thus might not require a sprayer at all! POP’s orchard tool collection available for borrowing at the West Philly Tool Library includes both hand sprayers and backpack sprayers. Use is restricted to organic sprays only. Keeping your orchard and gardening tools clean and well-cared for ensures your safety and that of your plants. Quality hand tools can last many seasons with proper care. Don’t use tools that need repair! It is unsafe for you and possibly your plant to use dull, rusted, or contaminated tools. Here are a few tips and practices to keep your tools in shape. Always remember to wear gloves when cleaning blades! Wipe the blades clean after every use. To remove sap, clean your blade with a cloth and kerosene. Use sandpaper or a wire brush to remove light to medium rust. Coat your tools and blades lightly with oil to prevent further rust damage. Keep moving parts oiled and tight. Keep your tools sharp! This will both make your work easier and is better for the health of your plants. The easiest option is a hand sharpener (like this one from Corona), which can be used without disassembling the tool. Keep the blade steady and sharpen along the beveled edge with short strokes. Never sharpen both sides of a pruning blade- only the beveled edge! Blades may also be sharpened using a sharpening stone, but disassembly may be required. Tools like shovels or axes may be used with a hand file. See further sources below for more details, or to see which technique will work best for you. Sand wooden handles with a medium-grade sandpaper and treat with tung or linseed oil. 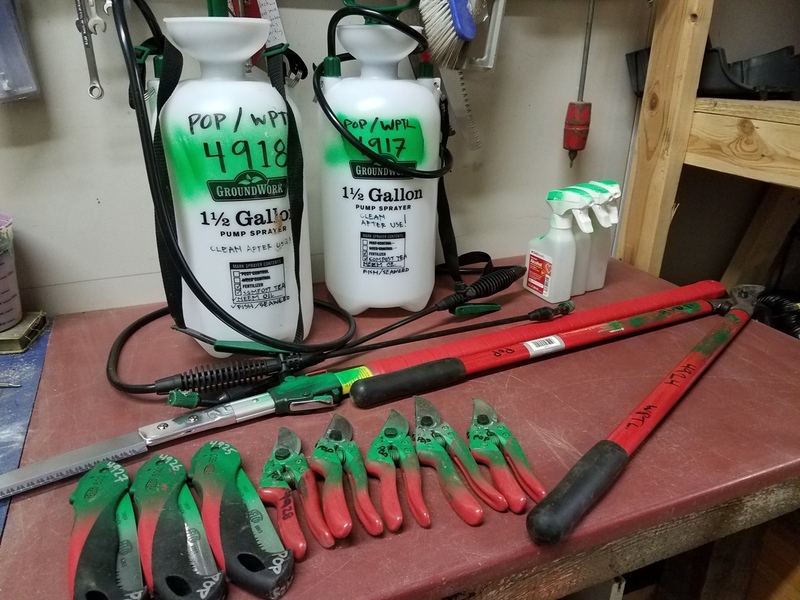 Disinfect your tools to avoid the spread of plant diseases! When pruning plants that are diseased, always apply isopropyl alcohol or a 10% bleach solution (90% water) in between each cut. This is also a good general practice for any pruning done during the active growing season. We prefer an isopropyl spray bottle for easy application, but dipping or wiping tools can also work. Store your tools in a toolbox or shed to prevent damage from excess moisture and light. Completely rinse and clean your sprayers after each use. Caring for your tools can take a bit of time and effort, but your plants and your hands will thank you! This edition of POP Tips prepared by Education Director Alyssa Schimmel and POP 2017 intern Abigail Dangler.